Better Looking & More Powerful! The must have form builder plugin for WordPress has had a complete makeover! 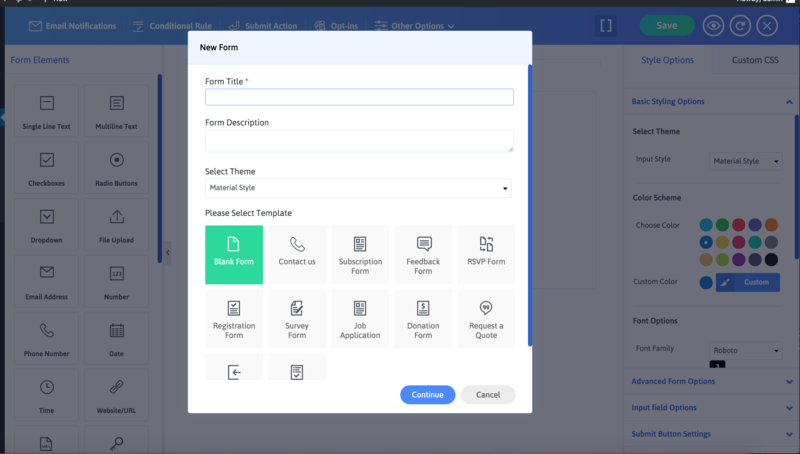 ARForms has an all new UI, designed to give users a real time experience, and it’s packed with powerful features so that you can prepare and process your forms at lightning speed. ARForms is one of the very few form builder plugins that offers a true material style forms, as well as rounded and standard style forms not limited to create just wordpress contact forms. Your wordpress forms, your way! Enjoy elegant, fully responsive forms straight out of the box, with clean and streamlined HTML. Great news! This advanced and complete form builder now has a built-in popup forms facility, so there’s no need to buy a specialised wordpress popup plugin. Your forms can fly in, stick to the bottom of the page, or popup on page load – all with ARForms. This sophisticated WordPress form builder plugin gives you complete flexibility to create forms that suit your needs. With ARForms, you can create multi-step or survey style forms, with tabs/steps or a progress bar so that users know where they’re up to. For an even smoother user experience, you can now set popup forms to open when users click on an item in your top navigation menu. so, no need additional plugins to open popup forms for wordpress from top navigation menu. This long-awaited feature has been added to the latest release of ARForms. Now you can add your own images or icons to act as radio buttons or checkboxes. This powerful capability allows you to set conditions on form fields to show/hide, enable/disable, or prepopulate a set value, based on the input values of other fields. ARForms has this enhanced conditional logic built right in, so you don’t need any technical knowledge to build sophisticated forms. With the latest version of ARForms you can easily perform calculations within a form, based on user input. You can calculate totals, averages and more, without any coding knowledge. ARForms supports 9 of the most popular email marketing systems so it’s never been easier to build your own forms and keep in touch with your subscribers. You can integrate using Webform or API for even more advanced features. Along with the support of other email marketing software ARforms allows seamless integration with popular Mailchimp for wordpress. The admin section is fully compatible with WPML so can be translated into any language. Your bundle includes 12 different pre-converted translations. ARForms includes 12 different ready-made form templates to get you started. A beautiful and effortless way to monitor all of your forms’ activity through vibrant, user-friendly graphs and charts, including a world map to show where all of your submissions have come from. To get even more out of your ARForms plugin, check out the wide range of free and paid add-ons. Create beautiful forms in just a few clicks, and check your changes on the front-end with an instant preview. Create wide range of fully responsive forms for all your needs: WordPress contact form, an opt-in popup form, a workshop registration form, surveys, a job application form, and many more plain and complex types of forms. Includes 12 ready-made form templates that can be fully customized. Choose from a wide selection of elements to build forms of all kinds. Simply drag and drop your elements into your forms and arrange them in real time. Choose your style from 15 pre-made color schemes. Includes the huge library of Google Fonts so you can get the look you want, in any browser. Enhance your forms with professional vector icons, fonts and logos. Create forms in true material style, as well as rounded or standard styles. Supports multiple columns, and you can re-size by dragging the column borders. Create forms for all purposes, including multi-step and survey styles, with progress bar. Now you can upload custom images to act as radio buttons or checkboxes within your forms. Embed third party objects, including videos, maps, and more. Format phone number fields to ensure that users enter valid data. Give users a helping hand with tooltips on hover or click. Use previous forms as templates. Option to add custom CSS, for even greater customization. Your sophisticated forms adapt to your users’ input, capturing the relevant data and saving time at both ends. ARForms uses seamless AJAX-based form submission. Quick and easy AJAX-based multiple file upload. 4 different actions upon submission, including Conditional Submission and Hide Form After Submission. 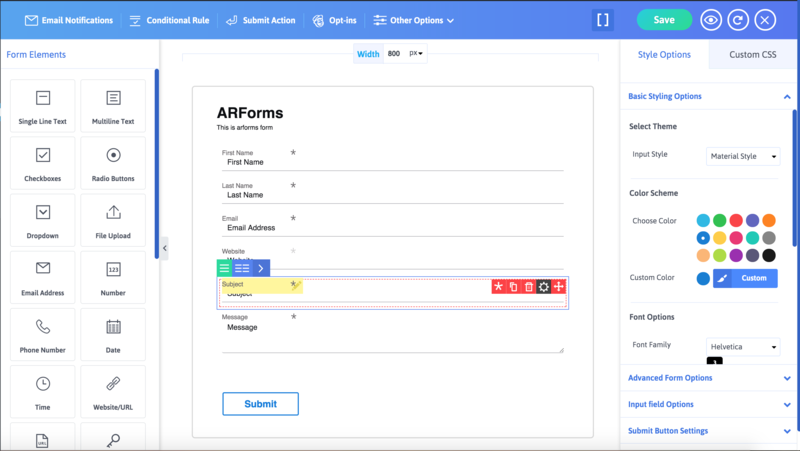 ARForms allows you to edit form entries even after submission. Easily perform calculations on data, including totals and averages, with no coding knowledge. Monitor your forms and analyze data using stunning graphs and charts. Import or export the data you need, or even entire forms, including all form settings. Automatically saves users’ progress, and populates prefilled data when users return to a form. Lightweight and streamlined, ARForms is fully optimized for speed. Your forms look beautiful and perform perfectly on any screen. Supports all popular browsers, including IE9, IE10, Firefox, Safari, Google Chrome, Opera, and more. No need for an extra popup plugin! Forms can fly in, stick to the page, or popup on page load. Popup forms directly from top menu items, without refreshing or loading a new page. Supports reCAPTCHA and custom Captcha. Verify passwords and display password strength. Automatically send dynamic emails to admin and relevant email addresses, upon submission, using shortcodes to pull values. Option to send email through an SMTP server. Fully compatible with WPML and includes 12 pre-converted translations. Supports a huge range of free and paid add-ons, including ActiveCampaign, PayPal and Authorize.Net. Added facility to display confirmation/summary on form submission. Added option to load form in Right to Left / Left to Right in RTL sites. Added facility to export form right from the form editor. Completely redesigned Editor. Major improvement in form editor to load forms faster. Added more options to import form. Added new facility to select double opt-in OR single opt-in method for MailChimp Email Marketer. Added new facility to select 24/48 hours format for datepicker field. Added new shortcode for hidden field to set current date value dynamically. Added Confirmation for reset styling in form editor. Bug fixes and optimized with php 7. Added More Font Awesome Icons. Added Max-length option for textarea. Getresponse api is chagned according to new version. Added styling options for Survery “Progress Bar”. Added month / year changable in datepicker. Small bug fixes related to form export/import. Small bug fixes related form title. Added facility to change subject of email seding out to Administrator. Bugfix: Small bug fixes related to File upload in IE 8, IE 9, Star rating. Bugfix: Small bug fixes related to Import / Export (Forms / Entries). import/export for forms to migrate pages. flying/sticky facility for modal forms. Bugfix: small bug fixes related to different theme compatibity. Bugfix: invalid file tyle upload message. Bugfix: small css based bug fix for checkbox,dropdown and other general formating etc.